As you see, the New Moon @15Sco11 perfects the morning after the 2018 Midterm Elections and as usual, marks the beginning of a new cycle with the Moon at the Point of Regeneration (15 Scorpio), aka, the Eagle Point. Without knowing who the victors will be as I type, this chart must speak for itself with restrictive Saturn @5Cap30 rising and acting as chart-ruler (Cap ASC) which makes no applying major aspects to other planets in the chart. 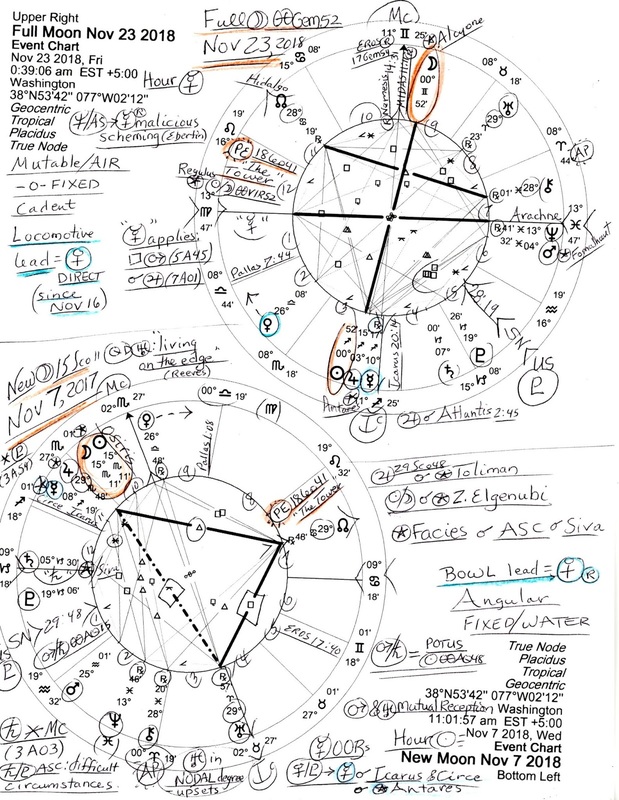 This emphasizes Saturn's sign and house position (12th house of Politics, Large Institutions, Self-Undoing, and Karma) but at least Saturn isn't afflicted in the chart and has left his off-again-on-again trine with radical Uranus conjunct the New Moon IC (Foundation; Endings; The Drain) from the 3rd house side and at a critical 29th degree of Aries, a disruptive placement of zealots, anarchists, and radicals. Obviously, Technology and Communications are part of this Uranian picture and of course, Mr. Trump is Uranian since natal Uranus is his guiding planet due to its oriental condition (last planet to rise before his Sun). 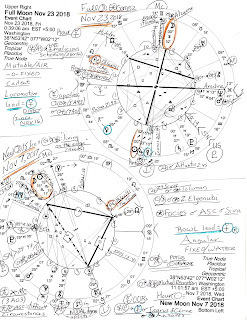 A side note of interest may be that asteroid Eros @17Gem40 (5th house; the piercing) conjoins Trump's natal Uranus, planet of chaos, disruption, and shock. Is this a reference to the Mueller investigation or its findings? Also prominent is rising Pluto @19Cap06 suggesting a tale of massive events coming up that are uncontrollable by mere mortals and possibly relate to surveillance and ties to the Criminal Underworld. As you've heard, Special Counsel Robert Mueller's report on Trump, the Russians, and -other- may drop as early as November 7th ('after' the Midterms). That the separative South Node ('SN'; the 'tail of the dragon') is in 1st house is a negative indicator, plus, SN conjoins US Progressed Pluto (29 Capricorn, a critical or crisis degree) and soon will swipe across US natal Pluto (27Cap33) suggesting potentials for self-reliance but also large-scale changes that affect others who are not consulted. 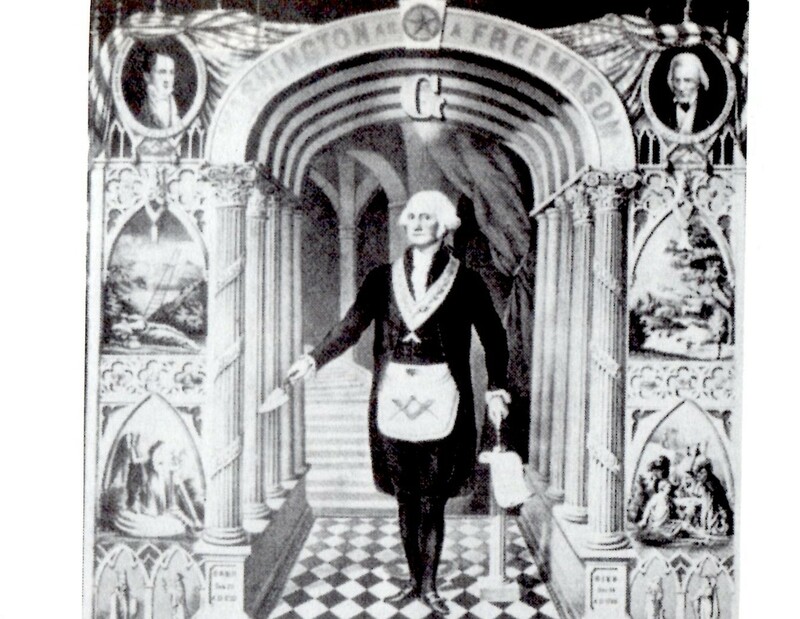 Adding to the complexity is the Mars-Saturn midpoint in 1st house which conjoins America's POTUS Sun (00AQ48 for Trump 2017) and forming a picture of a leader unable to meet all demands or master all circumstances. With SN conjunct POTUS Sun, Mr. Trump's popularity may be at low ebb as well which we discussed previously (exact on October 27th). In addition, we're still under the influence of 'The Tower' Solar Eclipse (18Leo41) with its theme of 'collapse of plans, lifestyles, and...edifices'. One result may be that Trump's tower of lies finally collapses into rubble but we must hope that, if so, this won't take America down too especially considering all the damage he's already caused our nation. Mercury @8Sag19 approaches warring star Antares, one of the Royal stars of Persia, and conjoins two asteroids: Icarus, associated with flying too high and crashing and assassination which could be a reference to the October 2, 2018 heinous murder of journalist Jamal Khashoggi and Trump's defense of Crown Prince Mohammed bin Salman ('MBS'), and Circe (where we rescue or seek rescue). Or, is another assassination on someone's November-into-December 2018 agenda? Perhaps but we should note that 17 Gemini+ is the position of Mr. Trump's natal 10th house Uranus ('18Gemini' = "Two Chinese Men talking Chinese in a Western Crowd"). Now in the Full Moon horoscope of November 23rd (upper right), we find Icarus Rx and still @17Gemini+ in 10th house although divine-retribution asteroid Nemesis @14Gem31 is nearer Midheaven ('MC' @11Gem25; the Goal Point)--and gold-hoarding MIDAS Rx @11Gem11 conjoins the MC (which may or may not be America's natal Descendant). A Venus-Uranus opposition across the 2/8 axis of Money, Values, Shared Resources, Credit/Debt, and Corporatism denotes potentials for 'a treasury showing unexpected rises and falls in its valuation, settings suddenly exploited for development, ruling bodies unable to cope with sudden infusions or lacks of funds, and/or unpredictable vanity shown by leaders or executives' (Munkasey). Eccentric spendthrifts, wastrels, over-indulgence, and extravagance are also suggested by the Venus-Uranus pair along with possible relationship breakups. And of course you see that the Full Moon @00Gem52 conjoins fixed star Alcyone with key words something to cry about. (Other stars are listed on the right side of the charts.) 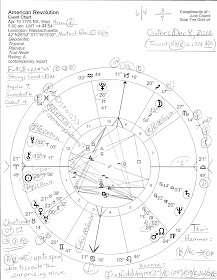 The Full Moon chart-ruler is Mercury turned retrograde as of the evening of November 16th @13Sag29 and as Rx chart-ruler suggests delays, reviews, revisions, and re-considerations of all kinds including plans and ideas. In fact, this regressive condition is at the Foundation of the Full Moon chart (Mercury Rx conjunct IC) which suggests that whatever was seeded at the November 7th New Moon will be under revision before the Full Moon rather than culminating at the Full Moon as planned. 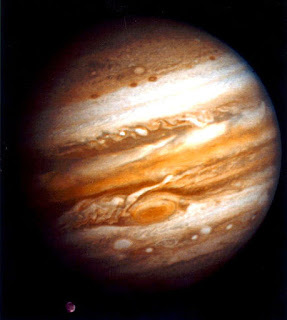 Chart-ruler Mercury makes two applying aspects: 1. square Mars (5A45) describing a period of frustration, incorrect information blocking goals, provoked anger, possible equipment failure, and rash actions; 2. conjunct Jupiter (7A01) showing expansive plans, an increase of international communications, news about legal affairs or decisions, and/or discussions concerning the employment of relatives. That this Rx condition of Mercury can affect Midterms' voting outcomes goes without saying for Mercury is the planet of vote casting, ballots, and decisions but hopefully, Midterm victors will be decided well before November 23rd--or counts will be ongoing or contested. Now there are many other chart factors of note in both charts but in line with my usual desire to keep this a post, not a book, I shall close for now and allow you to fill in the gaps and perhaps I'll see you at the voting booth November 6th!